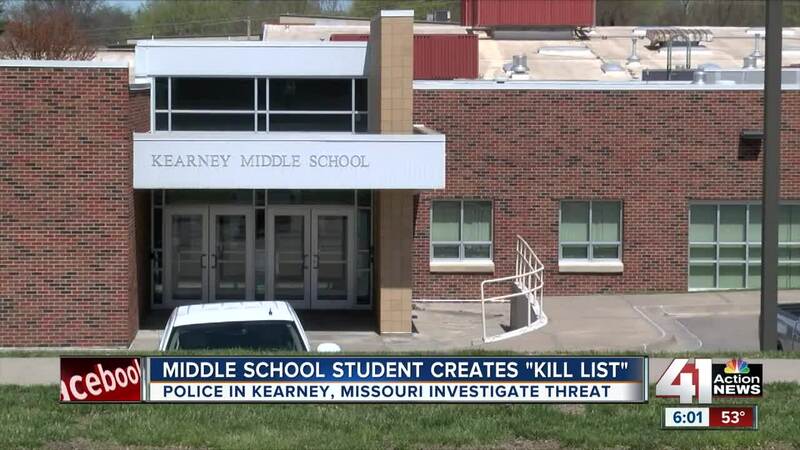 A Kearney Middle School student's "kill list" left parents and classmates frightened this weekend. The Kearney, Missouri, Police Department said Friday evening that it was aware of the alleged threats and was investigating. KEARNEY, Mo. — The Kearney School District superintendent said threats a student made at the Missouri middle school were not credible. Bill Nicely said, in accordance with district protocol, his office did not notify parents of the investigation because it was found to be non-credible. Nicely added he has learned from this situation and those lessons will influence how he communicates with families in the future. He apologized to families who felt left in the dark. Friday, parents at Kearney Middle School learned police were investigating a threat to the school from a Facebook post the police department made. A separate social media post said a student at the school created a hit or "kill list." Nicely said no list existed. But parents felt like they deserved more of a heads up. “This is not a 'point the fingers, he said, she said, somebody is wrong.' We need to come together, work together for a solution, so something like this doesn't happen and we can avoid circumstances like this and there is a much more open communication,” said Jason Rush, whose child attends Kearney Middle School. The superintendent said even in non-credible cases, the district brings in extra security and takes precautionary steps to ensure the safety of all students. The student who made what turned out to be non-credible threats was not in school Monday, according to Nicely. That news offered some comfort to parents. “There's been too many, too many tragedies. We don't need one here in our small town," said Katie O’Brien, a parent of a middle school student. "We are a small, loving community. We try to stick together and that's what this is about: sticking together and letting us know what's going on."